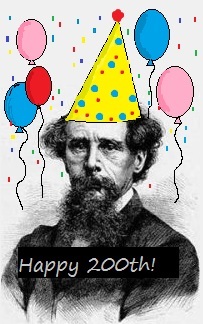 Home / Blog / Happy 200th Birthday, Charles Dickens! No, I’m not referring to the front man for Public Enemy (His birthday is August 1, fyi). I’m talking about the incomparable English novelist, Charles Dickens! The creator of such unforgettable characters as Oliver Twist, Ebeneezer Scrooge, Miss Havisham, Little Dorrit, Sidney Carton, Samuel Pickwick, and Uriah Heep, was born 200 years ago today. I found it surprisingly difficult to find more information on the linguistic contributions of Charles Dickens online. I therefore borrowed heavily from an excellent article by Ben Zimmer at Vocabulary.com. I highly recommend you click through and read it yourself! Like this post? Please consider sharing it or subscribing to our weekly email update! Post any comments and questions below. Remember: bloggers love comments. Uriah Heep was a band in the 70s. And 80s. In fact, I just looked them up, and they’re still going! And I thought Uriah Heep was a 70’s rock star. I guess I should bone up on more Dickens.